This fantastic home has it all - beautifully decorated & furnished, only steps away from some of the Outer Banks best restaurants, area shops, golf course, & more. Great Ocean Views from three-leveled deck, only one block to beach w/direct access, Life Guarded during the summer. Private Swimming Pool, Hot Tub, & separate den w/TV & Foosball table. 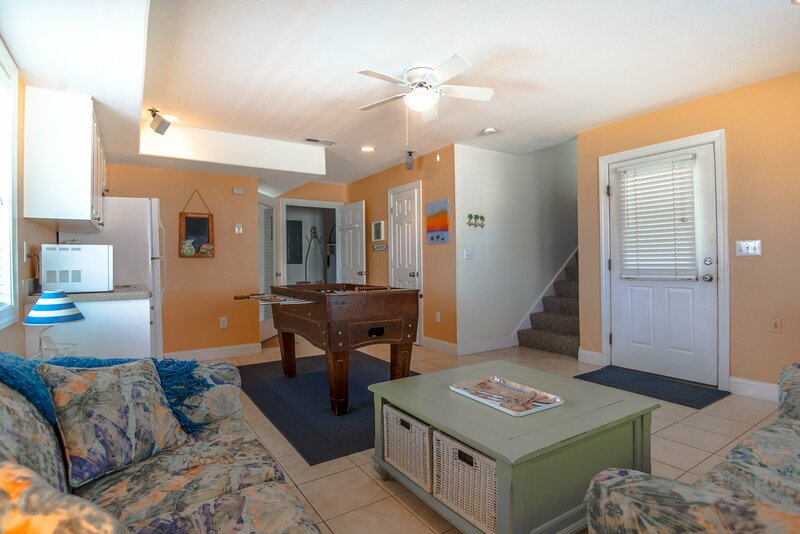 Ground Level: Covered Parking, Covered Entry, Game Room w/Foosball Table, Sitting Area, TV, VCR, Stereo w/CD, Full Size Refrigerator, Half Bath, Laundry Area, Access to Private Swimming Pool, Hot Tub, Enclosed Outside Shower, & Gas Grill. Mid Level: 3 Bedrooms (Master Suite w/Queen, Full Bath, & Private Covered Deck, 1 w/Queen, & 1 w/Queen & Bunk Set), Shared Full Bath, & Covered Deck w/Furniture. Top Level: Living/Dining/Kitchen Area, TV, VCR, DVD, Gas Fireplace, Master Bedroom w/King & Full Bath, Covered Deck w/Swing, & Access to the Observation Deck. Features include: C/AC & Heat, Washer/Dryer, Dishwasher, Microwave, Phone, 6 TVs, 2 VCRs, 2 DVDs, 2 Stereo's w/CD & Tape Player, Wireless Internet, & Ceiling Fans in All Rooms. Two Mature Dogs Allowed w/Fees. This is a Non-Smoking Unit. Convenient access to beach, lovely home, ocean views. Overall a nice place to stay. Loved all the pictures, and decor! We loved the backyard, pool and grass, perfect.